Marijuana accounted for 99.5 percent of Border Patrol drug seizures by weight at the U.S.-Mexico border in 2011, according to an analysis by Center for Investigative Reporting in California, which compiled the information into to an interactive map on its website. The Border Patrol seized at least 1.9 million pounds of marijuana on the U.S.-Mexico border in 2011. Second place goes to cocaine, with just 7,461 pounds seized. 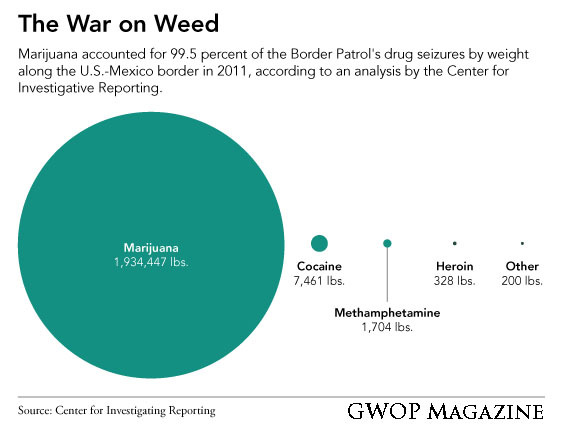 Of the 113,664 thousands drug seizures analyzed by the Center for Investigative Reporting from 2005 to 2011, nearly 89 percent involved marijuana. Cocaine trailed far behind, with just 7.4 percent. Government could save $13.7 Billion Per Year by legalizing Marijuana, according to Economist.